Europe has never been more accessible than it is today. With cheap flights between Europe and the U.S., it’s almost criminal not to go. 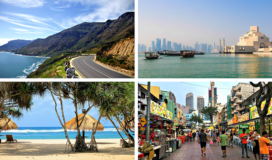 However, some people say “okay, so, it may be cheap to get there but where can I go that won’t break the bank?” Luckily, not every country in Europe will bust a reasonable budget. That’s why I put together 6 Cheap Holiday Destinations (based on my own experience). This list is for the budget conscious traveler who wants to see Europe and not count pennies every moment of the day. Don’t stay in the U.S. because you think your vacation will be cheaper. I can tell you, first-hand, that it’s possible to go to Europe for less than you’d spend on a week at Disney World (or even NYC). 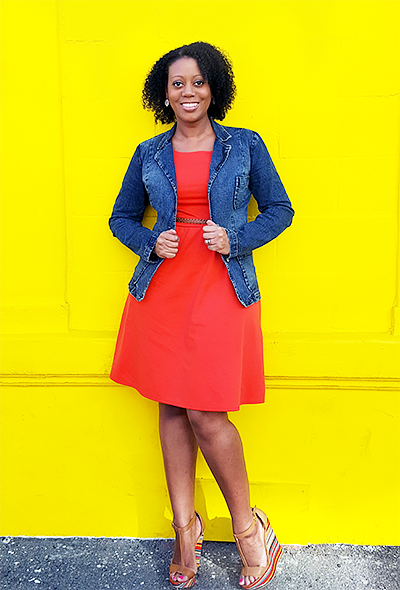 In these 6 cities, you can eat to your heart’s content, enjoy sightseeing, and find clean/affordable accommodations all within a reasonable budget. So, what’s a reasonable budget? Well, I think 2 people could visit each one of these cities (for 5 days) on a $1500-$2000 budget – excluding flights. For cheap flights, look at Wow Air and Norwegian Air. So, let’s check out these magical cities where your money goes further! *Originally published 4/2018 and updated 12/2018. This Balkans city has stunning landscapes, interesting food, and a long, troubled history. Don’t let the history keep you from visiting though. It’s, actually, the reason you SHOULD visit and learn how they came out the other side. 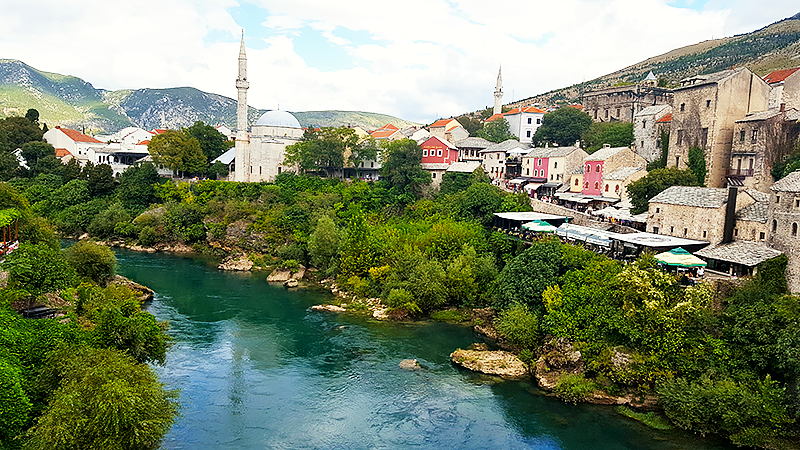 I had the pleasure of visiting Pocitelj and Mostar and I couldn’t get over the breathtaking views. Other popular cities in Bosnia and Herzegovina are Sarajevo, Konjic, Neum, Travnik, and Visegrad. If you don’t want to stay in Mostar, or Bosnia & Herzegovina, you can take a day trip from Dubrovnik, Croatia (#2) for a very reasonable price (~$35-$40). Currency: BAM(KM). The Euro is also accepted. Food: Dinner with 2 entrees & 2 drinks at a mid-range restaurant can cost around $15-$20. One of my favorite restaurants in Mostar was Restaurant Europa – Be sure to eat Cevapi with a side of Ajvar. Transportation: Buses and train are the most popular form of transportation. A one-way bus ticket around town, no matter the distance, will cost about .63¢. Yep, for less than $1.50, you can go from one end of town to the other and back. Accommodations: While we didn’t stay in Mostar, I know that guesthouses/B&Bs -$40-$60/night. Hotels (4-star/5-star) $80-$90/night. Bosnia & Herzegovina is really affordable. If you want to be closer to Croatia, choose a property in Neum which is just an hour drive to Dubrovnik and 1 hour and 30 minutes to Mostar. *Be aware that all prices are approximate and subject to change. 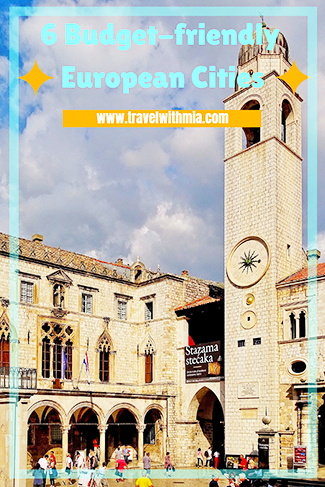 Another must-see, good for the budget, location in the Balkans is Dubrovnik, Croatia. 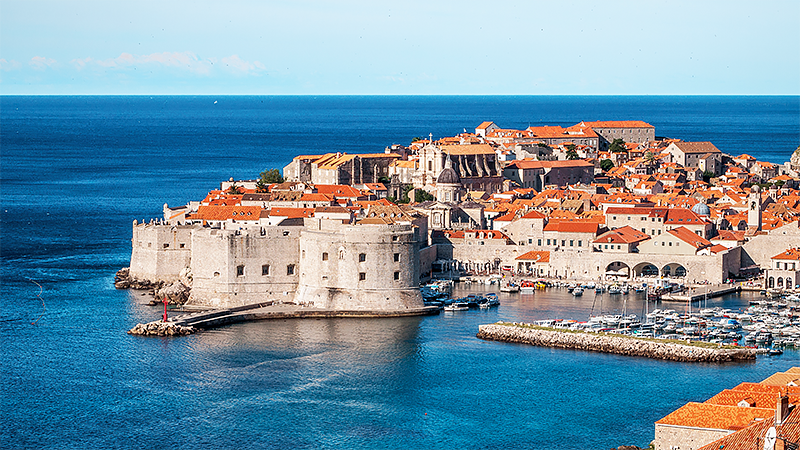 If you’ve seen Game of Thrones, you know about Dubrovnik as the show shoots around town. Even if you’re not a GOT fan (that’s me), you can enjoy the beauty, the people, and the food in the aptly named “Pearl of the Adriatic”. You can see plenty in a few days but if you really want to relax and feel like you’ve stepped back in time, stay for a week. 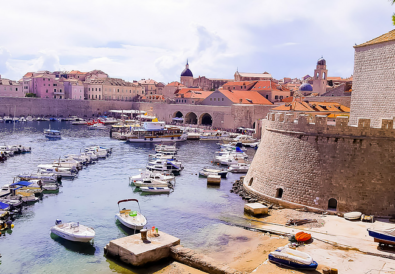 In that time, you can walk the historic City Walls, sunbathe at one of the many stunning beaches, and dance the night away in a 500-year-old medieval fortress. Luckily, all of this – and more – is within your budget. Food: Dinner with 2 entrees & 2 drinks at a mid-range restaurant can cost around $35 – $45 depending on the location. Dubrovnik has a wide range of restaurants and some are crazy expensive (dessert and a glass of champagne for $30) or crazy cheap (lunch with a cocktail for $8). Be aware of the prices before going in. One of my favorite restaurants in Dubrovnik was Dalmatino. Transportation: If you’re staying in Old Town, you can walk to everything within the walls. Getting around outside the walls, you can take a taxi ($5 to $25 depending on location) or the bus (less than $2). If you have time, and you’re really on a budget, you can walk from one end of Dubrovnik to the other. Accommodations: Dubrovnik has accommodations inside and outside the City Walls. Outside the walls will cost considerably less than inside. Our Airbnb – inside the City Walls – was just over $100/night which may sound expensive for a “cheap holiday” post. However, we had a 2 bedroom apartment located just behind the Stradun (the Main street and heart of Dubrovnik) and looking out onto the popular Gundulic square. Not to mention, the exterior of the apartment can be seen in several episodes of Game of Thrones – yep, that mattered to my husband. We paid just over $1000 for 7 nights including all applicable taxes and fees. 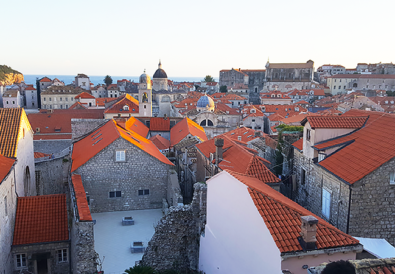 For more info, check out my post on Dubrovnik. *Be aware that all prices are approximate and subject to change. 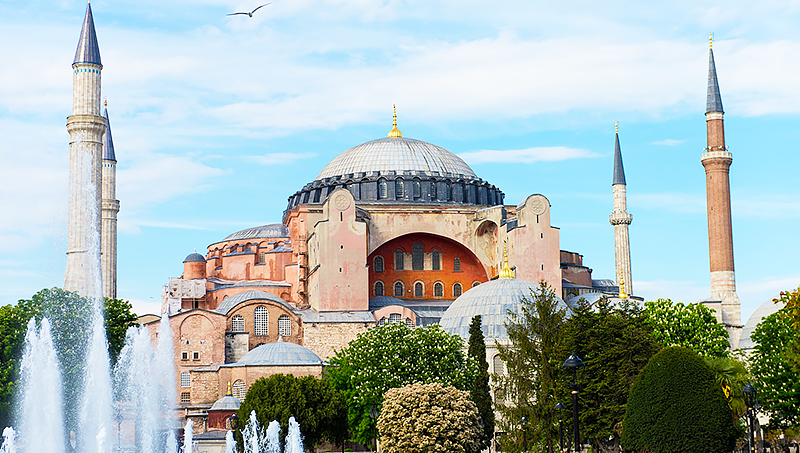 Istanbul is one of those cities that confuses people because it sits in Europe and Asia. With so much to offer, it’s no wonder roughly 10+ million people visit every year. You can shop the old world markets, relax in Turkish Bathhouses, and/or cruise the Bosphorus Straight. Seeing the sights won’t be a problem because the city is pretty affordable. However, if you like to cook, beware of the Spice Market – I blew my shopping budget in one trip! Food: Dinner with 2 entrees & 2 drinks at a mid-range restaurant can cost around $20 $25. For an upscale restaurant, you should add ~$20. One of my favorite restaurants in Istanbul was Hamdi. Transportation: Buy the Istanbulkart for Buses, trains, trams, and funiculars, etc. $10 will get you 12+ rides during your stay. You can add money as you need it. Accommodations: For this trip, we chose the Courtyard Istanbul International Airport because our flight was super early. Our room was booked with points from my Chase Sapphire card but the cost was about $52/night. The hotel was incredibly clean, modern, and secure (I’m talking metal detectors at the entrance). I would gladly stay there again. *Be aware that all prices are approximate and subject to change. Prague is full of history, character, and beer (or Pivo). Known as the “beer capital” of the world, you shouldn’t leave town without trying at least a few. Not only is there a ton of beer, but there are also lots of things to do in this European hotspot. 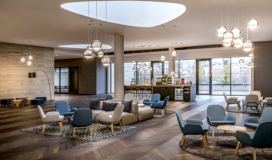 Whether you’re retracing the steps of famous author Frank Kafka, shopping in Wenceslas Square, or roaming the Jewish Quarter, you’ll find yourself surrounded by unique charm. 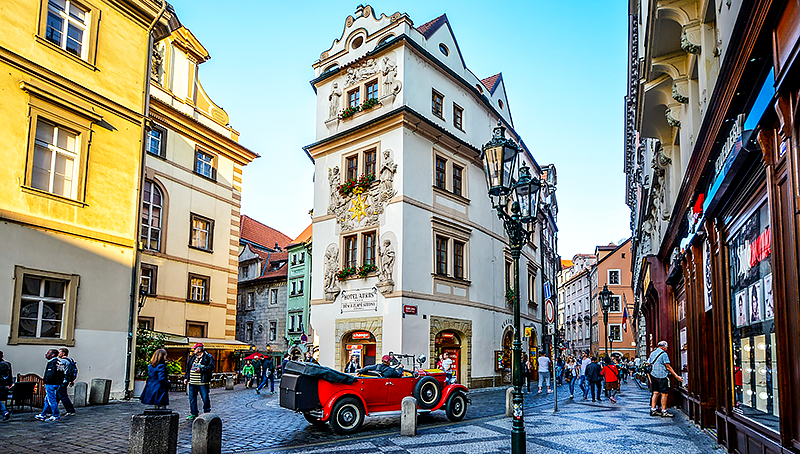 From colorful streets and Gothic architecture to a stunning castle and a 600-year-old Astronomical Clock, Prague has it all – within your budget. Food: Dinner with 2 entrees & 2 drinks at a mid-range restaurant can cost around $20 to $25 outside of Old Town. In Old Town, you can expect to spend ~$10 – $20 more. One of my favorite restaurants in New Town Prague was Pivovarsky Dum. Transportation: Prague is very walkable if you’re staying in Old Town or New Town (a few other areas as well). If you’re not big on walking, you can take the tram or call Uber. We took an Uber from New Town to the main bus terminal and it cost us $3 USD. Very reasonable! Accommodations: On our first trip, our 1 bedroom Airbnb was $34/night and we stayed for 11 nights. We paid less than $400 including all applicable taxes and fees. We stayed in New Town which is just a short walk (10 min) to Old Town – the main square in Prague. On our second trip, we stayed in the Karlin neighborhood which is super trendy right now. It’s closer to the main bus station than Old Town but you can still walk there in 20 minutes or so. Our Airbnb was $55/night and we stayed for 5 nights. We paid less than $300 including all applicable taxes and fees. For more info, check out my post on Prague. *Be aware that all prices are approximate and subject to change. Spain is a beautiful country with a rich history, vibrant culture, and mouth-watering food. Luckily, it’s as affordable as it is interesting. 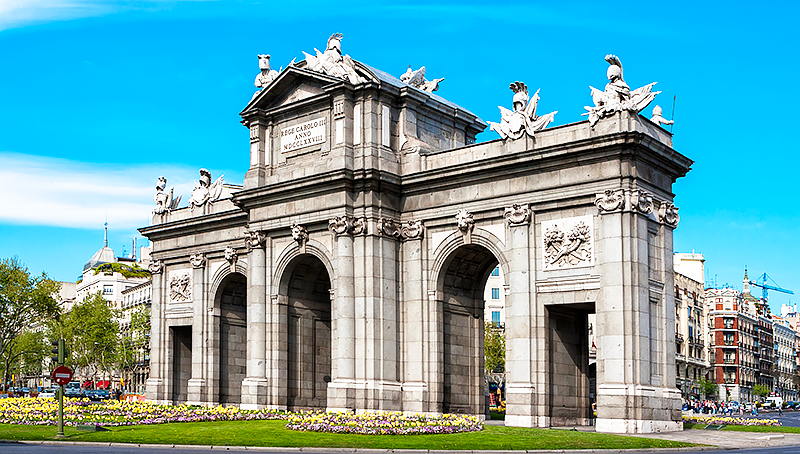 Madrid is the capital and largest city in Spain with a population around 6.5 million. It’s a bustling, cosmopolitan city that serves as the financial center of the country. 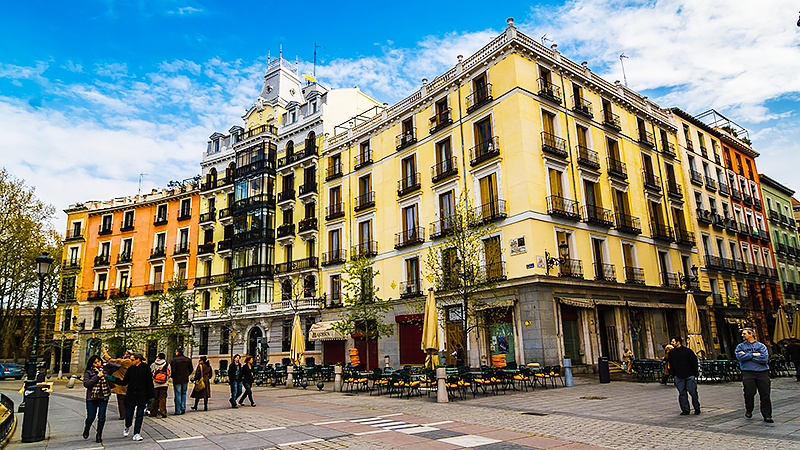 With that said, Madrid is – overall – very affordable so spending time there won’t blow your budget. There are plenty of free things to do if you want to keep costs down. Even if you want to see it all, you can do it within your budget. Food: Dinner with 2 entrees & 2 drinks at a mid-range restaurant can cost around $35 – $50. You have your choice of upscale restaurants, sidewalk cafes, and tapas bars. You can’t go wrong with either but the prices will vary widely. One of my favorite restaurants was Lateral located in Plaza Santa Ana. Transportation: Purchase the “Tourist Ticket” and have unlimited use of the metro, bus, and local train services. These tickets are available for one, two, three, five or seven days, and prices range from $10 – $43 for the most popular tourist zone. Accommodations: We snagged an Airbnb for $67/night in Plaza Santa Ana and it was walking distance to many of the popular sights like Plaza Mayor and Puerto del Sol. We stayed for 5 nights and paid less than $400 including all applicable taxes and fees. For more info, check out my post on Madrid. *Be aware that all prices are approximate and subject to change. Tallinn is the capital of Estonia and quite a large city with a population of nearly 500,000 (about 1/3 of the entire country). This up-and-coming destination has been put on the map with their colorful Old Town, unique architecture, and delicious foodie scene. It may not have been on your radar but I promise you won’t be disappointed. The city is beautiful, it’s affordable, and the people are engaging. What more could you want? Food: Breakfast can be quite affordable and one of my favorite places was Cafe Grenka. Our bill for 2 omelets, 1 cappuccino, and 1 spiked coffee was $16. Dinner with 2 entrees & 2 drinks at a mid-range restaurant can cost around $25 to $50 in, and around, Old Town Tallinn. For a unique, traditional meal try Olde Hansa. 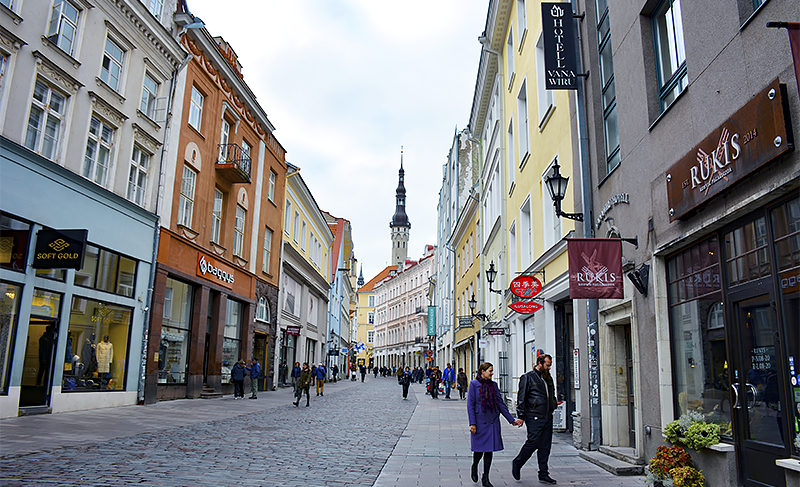 Transportation: Tallinn is a very walkable city so you can reach most places on foot or bicycle. If you want to get to some of the farther places you can take public transportation (bus, trolley, & tram) which is pretty easy to navigate. If you’re not big on walking, cycling, or public transportation you can call a taxi or use rideshare apps like Uber and Taxify. We took Uber and Taxify around town and Taxify was a bit less expensive and there were more cars available. 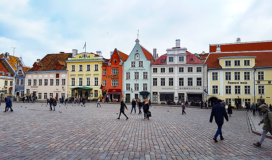 Accommodations: My visit to Tallinn was sponsored by the Tallinn Tourism Board but I did some research on hotel and vacation rental prices. A local, 4-star hotel in, or around, the city center can run anywhere from $80 – $150/night. 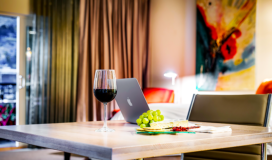 You won’t find many hotel chains in Tallinn (which is a good thing) so you’ll have to do your research by checking out the reviews. 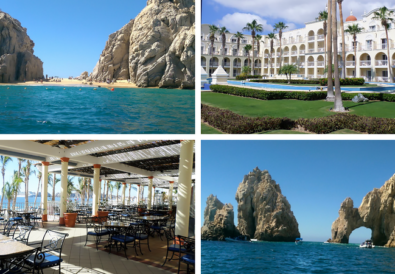 Luckily, there are plenty of beautiful hotels that offer upgraded rooms and amenities for an incredible price. Vacation rentals, like Airbnb, are even more affordable with prices, on average, around $30 – $60/night. 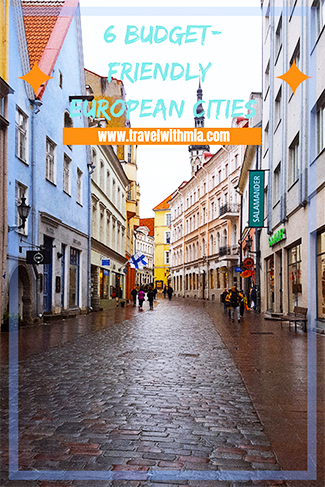 For more info, check out my post on Tallinn. *Be aware that all prices are approximate and subject to change. 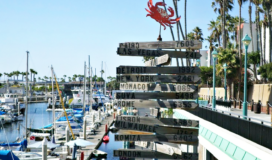 These are just a few of my favorite, cheap holiday destinations. I would also recommend Greece, Romania, and Slovakia. While other cities may cost more, in general, it’s possible to make (almost) any destination affordable. Eat breakfast at a cafe, grab some street food for lunch, and splurge on dinner. 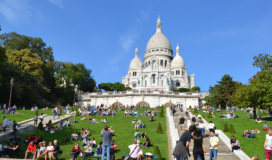 Try “free walking tours” instead of expensive group tours and private tours. Purchase alcohol for your room so you can “pre-game” before you go out for the evening (or afternoon!). Buy entrance tickets a few months in advance so you can keep your “in town” costs to a minimum. I hope these tips will help make your next cheap holiday destination affordable and fun! *Prices are subject to change and all information is based on my own experiences.